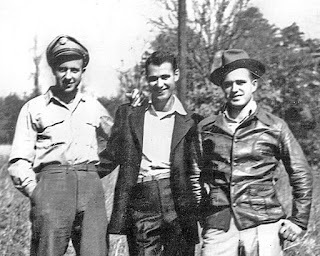 Left to right: Ernest, George and Charlie Morrow. They were the sons of Arthur and Novie (Caldwell) Morrow of Del Rio, Tennessee. When World War II began, Arthur and Novie Morrow of Del Rio had already weathered many storms. Arthur was from the Boomer Den community, up near the Tennessee/North Carolina state line above Del Rio. Son of Bulow and Eva (Guffey) Morrow, he was one of six children. Eva died when the children were young and Bulow remarried, this time to Etha Norwood, and they became the parents of three children. Arthur became acquainted with Nova Caldwell at Mulberry Gap Methodist Church. In those days, much courting was done at church services, and the young couple quickly decided they had found their life’s partner. They married when Arthur was 19, and Nova was 14 years old. Shortly after their marriage, when Novie was only 16, both of her parents died within weeks of one another in tragic logging accidents. The year was 1914 and Novie’s parents, Dan and Minerva Caldwell, were working in a small lumber operation up on Round Mountain in Del Rio. Dan and Minerva were using a long crosscut saw on a large tree on the mountainside when they cut through it quicker than expected. According to an account of the accident in By the River and Beyond by Nathan Jones, “The huge log came loose and rolled over her completely crushing her body and killing her. She was a hard working woman who worked like a man.” Just a few weeks later, Dan, too, died in a logging accident eerily similar to the one that claimed his wife. When he and another fellow cut a large tree with a crosscut saw, the tree began to fall and crushed Dan who was unable to get out of the way. Novie was the oldest of the Caldwell children and, little more than a child herself, took two of her siblings to raise. As the years passed, Arthur and Novie’s own family grew to number eight children, the oldest a daughter Annie, who was followed by seven brothers: Ernest, Charlie, George, James, Robert ‘Bob’, Donald, and Jack. 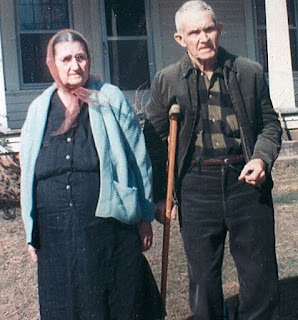 Novie and Arthur Morrow posing for this picture taken at their home in the 1960's. Two of the boys, James and Bob, were deaf mutes, a condition that didn’t hinder them too much, but in those days before special education classes, physical and vocational therapy, and other help, it still had to be a tough situation. The family weathered the Great Depression, working and saving, somehow managing to remain intact and have food on the table in an era when many Americans faced actual starvation. Arthur was a sharecropper, so the family moved periodically. As a result, the children’s schooling took place all over the county, from Harmony Grove to Edwina to Cosby. Three of the boys, Ernest, Charlie, and George, answered their country’s call during World War II. As the oldest, Ernest was the first of the Morrow brothers to lay down his plow. Already in the CCC’s, where he helped “build Great Smoky Mountains National Park.” Leaving that group, he next picked up a rifle and served in the United States Army a total of seven years, under the command of Gen. George Patton all across Europe. In later years, he recalled Patton’s habit of “cussing all the time.” He lost half of one of his feet when he stepped on a landmine while checking for such dangers ahead of the approaching Allied forces and had to wear a prosthetic. After leaving the service, he sold artificial limbs to other veterans with similar losses and traveled extensively. Already married to his wife Marie when war broke out, he and his wife lived in Newport for a time about 1947, and he operated a shoe shop where Diana’s Beauty Shop is today. Herbert Butler helped him during this time. “He made sandals,” recalls his sister-in-law Ruth Maloy, whose first husband George, was Ernest’s brother. “All the girls that were graduating from high school bought his sandals. They cost $5 a pair.” But Marie didn’t care for Newport, so the couple moved to Knoxville and he returned to his work as a traveling salesman. At one time they lived in Gadsden, Alabama, but eventually retired to West Palm Beach, Florida. George Morrow treasured this photo of his buddies in the South Pacific war zone. Charlie was the second of the Morrow boys to serve his country. He also was in the CCC’s and helped build the rock wall at Clingman’s Dome. 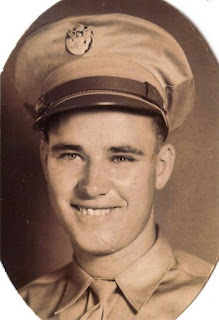 Charlie saw service in the United States Air Corps and took his training in Texas and later went to England. “He stayed there mostly,” says Ruth, “loading bombs onto planes and driving trucks. While in England, he learned to like tea.” He also “learned to like” a young woman named Kathleen Court, who promised Charlie she would write his sister, Annie. It was a promise Kathleen would keep, even though she and Charlie never married. For over 40 years, Kathleen and Annie kept up a correspondence, and in 1982, Kathleen and her sister-in-law Heather Court paid a visit to Annie while in the United States for the World’s Fair in Knoxville, Tennessee. As the Allies moved closer to Berlin, Charlie was sent to Germany and was on a train there when he learned the European war had ended. Charlie received the European-African-Middle Eastern Service Medal with one Silver Star and one Bronze Star. Returning to America, he took advantage of the new G.I. Bill and took training as a mechanic, working for some time for Connie Overholt and Jake Wilds in their car dealership near the courthouse. About 1949, he opened his own garage up in Del Rio in a building owned by Frank Huff, Jr. “It was behind Carlisle’s Store,” recalls Ruth. “He did well, working there until 1963 when he bought his own place. From that time on he farmed and logged.” Charlie married Frances Burgin and they had three boys: Curtis, Jerry, and Tom. Sadly Frances died of cancer at age 34. Charlie married again, this time to Stella Roberts Woody, and they had no children. The youngest of the Morrow boys to do his bit was George, who struck out on his own when he was 16. His widow Ruth laughs, “He went to New Jersey to work. He lied about his age, claiming he was 19. He drove a truck there for Dewey Strange and worked about a year.” At 17, he left Cocke County again, this time going to Gastonia, North Carolina, where so many others had found work in the textile mills. His older sister, Annie, was already there. “He stayed in Gastonia about six months, and then tried to volunteer for military service at 17,” says Ruth, “but had to wait until he was 18. He served in the Army.” George enlisted in Company F, 17th Infantry Combat, on February 24, 1943 and was honorably discharged November 30, 1945. His tour of duty took him to the Aleutian Islands and on to the South Pacific,, where he found himself in the midst of some of the most brutal fighting of the war. His list of medals and citations is lengthy: four Bronze Stars, three Purple Hearts, two Bronze Oak Leaf Clusters; the Philippine Liberation Ribbon; two more Bronze Stars and four Bronze Service Stars. A photo of George Morrow. He is one of the most decorated soldiers ever in Cocke County, Tennessee. George was wounded three times within a ten-day period. 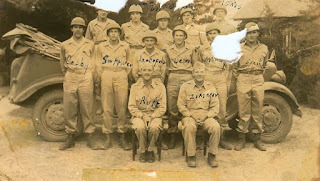 On January 6, 12, and 16, 1945, he received shrapnel wounds in each leg and at the back of his head. After the war, George returned to Newport. “He made it to Knoxville and then got a ride from there to Newport where he struck out walking up the Asheville Highway. When he got to the intersection down here, he ran all the way home, he was so happy,” says Ruth. At first the couple rented a home from Frank, Jr. and Cleo Huff, but then George was laid off from his job at the Tannery. “He went to Cleveland, Ohio to work in the aluminum company and came home once a month,” says Ruth. With the safe return of their three sons from war zones in both Europe and Asia, Arthur Morrow’s dire prediction was proven wrong. “When the boys left,” Ruth says, “he was distraught. He told Novie, ‘Neither one will come back. They’ll all be killed.’ But Novie told him, ‘Oh, no. I’ve been praying. They’ll be back." And they were, after having done their bit. * Duay O’Neil is an Assistant Editor of the Newport (TN) Plain Talk newspaper.